I read this article and found it very interesting, thought it might be something for you. The article is called News nuggets from the campaign trail and is located at https://votesocialism.com/news-nuggets-from-the-campaign-trail/. Last week, Washington Federation of State Employees Local 1488 (University of Washington workers) invited Steve to speak to its membership and then endorsed his campaign! In discussion, members expressed concern about the attacks on Social Security and the outsourcing of laundry work at the UW hospital. Prior to the WFSE 1488 meeting, the union held a rally protesting the loss of members’ jobs in the laundry area of the university and its medical facilities. Steve spoke at the rally and afterwards protesters marched to the university president’s office to demand that the UW stop wiping out good union jobs. 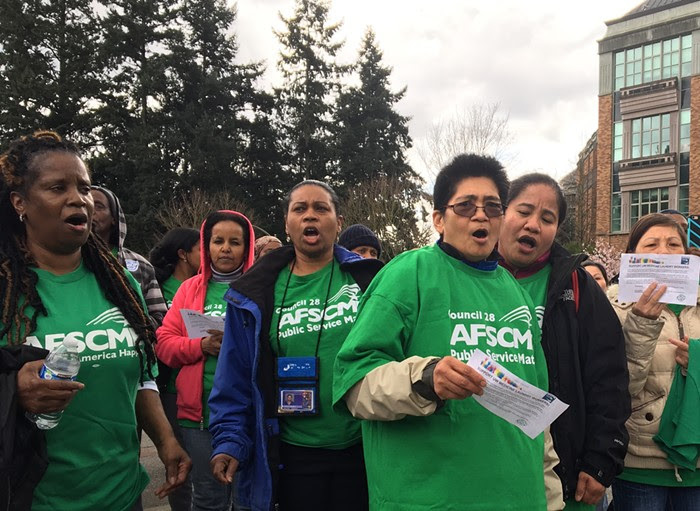 Unfortunately, the next day, UW officials sent 60 layoff notices to laundry workers, showing their complete disregard for WFSE members. The Hoffman campaign will join another rally on April 9. Steve spoke at several other union meetings in the past few weeks and at a rally of Veterans Affairs hospital workers on Beacon Hill in Seattle. Alt-right Patriot Prayer leader Joey Gibson, running as a Republican, has entered the same U.S. Senate race Steve is in. Gibson and the Patriot Prayer group regularly attract white supremacists and fascists to their gatherings, and the Freedom Socialist Party has been instrumental in organizing opposition to them in several cities, including Seattle. Steve has been a leader in those efforts, getting support from his union, WFSE Local 304, to oppose these right-wing thugs. Read about his track record here. Next up: This coming week Steve and volunteers travel to Spokane, Wash. He’ll be speaking at a union meeting, at Whitworth University, and at a special meeting co-sponsored with Socialist Alternative Spokane. Email the campaign at VoteSocialism@gmail.com or call 206-722-2453 if you would like to attend this public event or meet with Steve while he is in Spokane. Here are a couple key events next weekend where we’ll be campaigning and gathering signatures to get Steve on the ballot. Could you help out? If so, call or email the campaign. Information picket to expose ties between New Seasons Market and anti-labor Murdock Trust — Saturday, April 14, 11:00am, 2755 77th Ave. SE, Mercer Island. Tax Rally 2018 – Invest in All of Us – Saturday, April 14, 2:00pm at Judkins Park, 2150 Norman St., Seattle.